Today there are over two million foreigners living in Switzerland. They account for almost a quarter of the total population. But who are these foreigners who are often at the center of political debates? Switzerland is one of the countries with the highest proportion of foreigners (24.9% in 2016) in its territory. Only a few individual cases, such as oil countries or city-states like Luxembourg, have even higher rates than Switzerland. The chart below shows the nationalities of all foreigners living in Switzerland. Over 80% come from European countries. 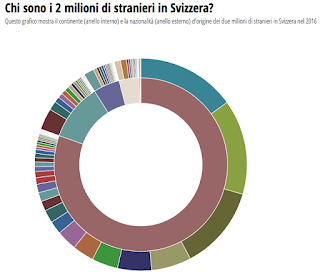 German, Italian, Portuguese and French citizens alone account for almost half of all foreigners in Switzerland. Did you know that the permanent and non-permanent resident population of Ticino was 354 375 for 2016? Take a peak at the latest statistics chart by the Swiss Federal Statistical Office. Click here for a cool interactive chart from SwissInfo.